Where to place the wine and glasses in the kitchen? Wine storage shelves are good solution to this headache. 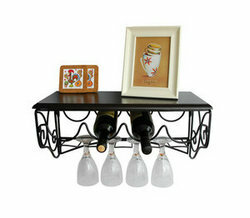 You can place wine bottles and glasses safely on shelf and it is very convenient to take them from the shelf when drink. Wine storage shelves are elegant in design, sturdy and safe. Mental parts unti-rust. Wine storage shelves sure bring you interesting.